What better way to celebrate Halloween than with a good gothic novel? I don’t mean a “good” novel with elements of the gothic, like something by the Brontës or Nathaniel Hawthorne. I mean a proper 18th/19th century gothic novel, like those written by Anne Radcliffe, Horace Walpole, and Matthew Lewis — something chock-full of raging storms and seething passions and tormented spirits lingering in darkened stairwells. Something absolutely, utterly terrible. Finding an appropriate gothic novel for this review was a bit of a problem. We only write about seafaring books here, and most popular gothic novels take place in deserted Medieval monasteries or windswept highlands, not on boats. After all, you’re not likely to find the crumbling ruins of anyone’s haunted ancestral home on the high seas. That’s why we were so lucky to discover The Phantom Ship, by Francis Marryat. 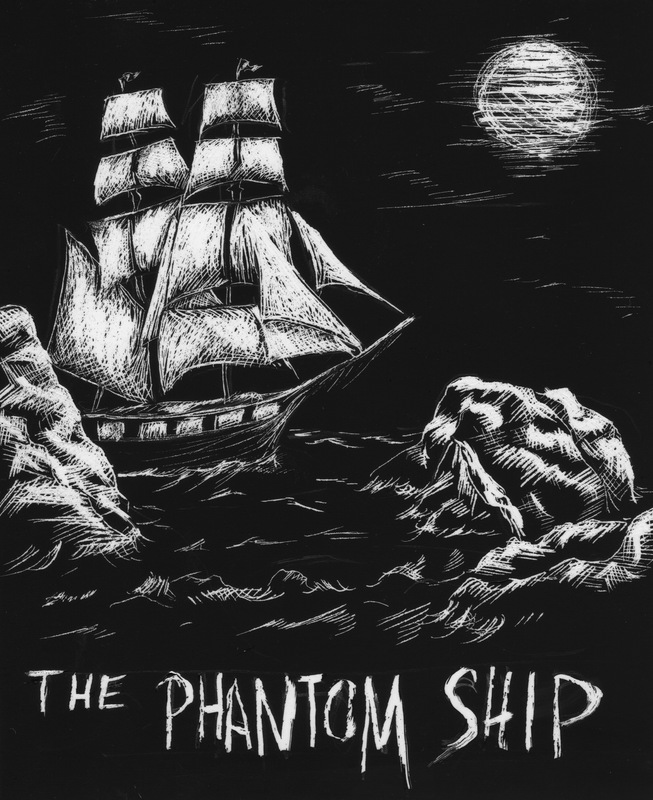 The Phantom Ship is even more exciting than your run of the mill Victorian trash fiction because it is not only gothic in the truest sense of the word (i.e. not likely to appear on a high school literature syllabus anytime soon), but also a maritime novel. As such, it offers a splendid merging of the two genres, presenting us with all of the best tropes and conventions of both smashed into one. On the maritime side, we find: a brutal and unreasonable captain, avaricious and mutinous men, lots of spirits (the alcoholic kind), shipwrecks, heroes washed ashore, barrels full of Spanish gold, sea battles, splintering hulls, besieged fortresses, traitorous foreigners, ferocious gales, and more than enough natives to make a post-colonial scholar cringe. On the gothic side, we have: mysterious holy relics, beautiful Arabian maidens, lots of spirits (the ghoulish kind), sorcery and potions and spells and witchcraft, zealous priests, undercover Catholics, beings not of this earth, unheard of miracles, multiple supplications to the Creator (meaning G-d, not the author of the book), prophesies, ominous portents, a frightful man with a single bulging eye, fits of insanity, werewolves, lots of talk of destiny, and plenty of elements that are entirely tangential to the plot and just thrown in there to drag the novel out to an almost intolerable length. And let us not forget that mainstay of every good gothic novel: the Spanish Inquisition. Just when you think the loveable heretics are safe, the Inquisition pops up to shock all good followers of the Church of England into at least one more year of fervent anti-papism. Although books of this sort are rarely truly scary, The Phantom Ship gets off to a promising start. It opens in the kitchen of a charming 17th century Dutch cottage, where Philip Vanderdecken is discussing his career prospects with his emotionally unstable mother. Like all heroic and brave young Dutch men in the 17th century, he would like to go to sea. When he tells his mother this, however, she promptly starts vomiting blood. The blood vomiting being of a very serious nature, the mother sadly dies, but not before she tells the son the truth about his father’s disappearance. It seems that his father is a sea captain who was much delayed in returning home until one evening when his wife, sitting in their comfortable and stylish parlour, observes him appear at the window, dripping wet and bearing a mournful expression. With horror, she realizes that this is no flesh and blood husband, but an unholy apparition! The disembodied Captain Vanderdecken tells her that he is caught IN LIVING JUDGMENT (yes, in all caps) and doomed to fight through an eternal gale aboard his ship, The Flying Dutchman, as recompense for a blasphemous oath he made in a fit of murderous passion. Stay! There is hope! Captain Vanderdecken has but one chance of release, which he has carefully detailed in a letter that he is now delivering to his wife in the hope that she will read it and contrive to save his mortal soul. This is clearly a misjudgment on his part, as his manner of appearance is so terrifying that his wife runs out of the room and locks it forever, leaving the letter behind, unread, and her husband’s only chance of salvation along with it. Since the family’s entire savings is tucked away in an iron safe in the parlor, Mrs. Vanderdecken and her son are forced live in penury. Philip accepts this situation until he reaches manhood and starts to feel that his is not the most desirable state of affairs — hence the plan to go to sea and make a little cash. Now that his mother has conveniently expired, Philip is free to enter the forbidden room, where he finds all sorts of wonderful things: buffets full of silver vessels, thousands of gold gilders, and abandoned bird cages, empty except for little heaps of bones and feathers that are the only remnants of their former occupants. Philip has suddenly become rich and no longer needs to make his fortune aboard a trading vessel — or so he thinks. Once he reads the fateful letter, he must accept that life at sea is indeed his destiny, for it is only Philip who can release his father from the bonds of LIVING JUDGMENT by tracking down The Flying Dutchman somewhere in the South Seas and presenting his father with the holy relic that will grant his salvation. He vows to fulfill this most sacred filial duty, whatever the cost, and the tale begins! I was saddened to learn that The Phantom Ship was not a critical success when it was published. Yes, the dialogue is trite and wooden, and the adventures do tend to escalate in improbability as the book goes on. The ending only seems to be brought about because Marryat grew tired of writing the book, even though he could have saved himself the effort and stopped about 100 pages earlier — for which his readers would have been grateful. But, it’s not like there weren’t plenty of critical successes in the 19th century that weren’t also absolutely terrible. And The Phantom Ship has some genuine thrills, like when the crew spots another vessel in the distance and with horror realizes that it is plowing straight for them and they are in the middle of the squall and cannot helm away and it seems that there will be an awful collision until suddenly, to the mortal terror of everyone aboard, the ship passes right through them, as though made of nothing but mist and air! They see the crew of the phantom ship peering at them over the gunwales and Philip’s father, still young and handsome, standing on the deck, living out his painful existence IN LIVING JUDGMENT and waiting for Philip to fulfil his holy purpose and save him. It’s a wonderfully exciting moment. You can find it on page 243 if you don’t feel like reading the entire thing. There is a point at which every proper gothic novel becomes nearly unreadable, and that occurs only about 55% of the way through The Phantom Ship — probably a record for the genre, as the majority wear out their charm halfway through the second chapter. Anyway, its defects are more than compensated for by its extraordinary beginning (death by vomiting blood! fathers caught IN LIVING JUDGEMENT! piles of canary bones at the bottom of neglected cages! ), along with the truly terrifying ghostly visions and clever incorporation of every gothic stereotype imaginable. The most interesting thing about Frederick Marryat is that he is actually responsible for inventing the maritime novel — and therefore all of those tropes which much better novelists, like Robert Louis Stevenson, Herman Melville, and C.S. Forrester, later pilfered and used to greater effect. I don’t mean to be so hard on old Frederick, anyway. Gothic novels are always horrible — it’s part of their very nature. Like many maritime novelists, Marryat was a retired sailor and knew his subject well. Supposedly, his non-gothic, seafaring novels and true-life accounts of life at sea are actually quite good. And, once I have fully recovered from the agony of reading all 401 pages of The Phantom Ship, I sincerely hope to read them. Previous Update #4: Highbrow Stuff and…WE HAVE A STARBOARD ENGINE! Eagerly awaiting a November post.